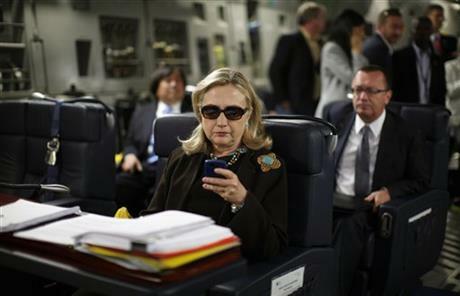 Throughout the controversy over her use of a private e-mail system while she was secretary of state, Hillary Rodham Clinton has described her decision last year to turn over thousands of work-related e-mails as a response to a routine-sounding records request. But State Department officials provided new information Tuesday that undercuts Clinton’s characterization. They said the request was not simply about general rec­ord-keeping but was prompted entirely by the discovery that Clinton had exclusively used a private e-mail system. They also said they first contacted her in the summer of 2014, at least three months before the agency asked Clinton and three of her predecessors to provide their e-mails. Most likely Clinton-apologists, who have been spreading false claims that she was “cleared” by the State Department, will continue to ignore such information which contradicts Clinton’s statements. Hillary Clinton continues to make the false claim that what she did was allowed despite being contradicted by multiple fact-checking articles and government officials. In other developments, the FBI has reportedly recovered email which was deleted from Clinton’s server. It is unlikely the public will obtain any specific information in the near future. It has already been established that email deleted by Clinton included email related to Libya and terrorism, as opposed to being limited to personal email. This all comes as Clinton continues to fall in the polls. She received yet another setback this week when top unions have decided to hold off on making an endorsement in the nomination battle. Posted in Hillary Clinton, Politics, Polls, Scandals. Tags: Hillary Clinton, Scandals. RSS feed for comments on this post.. TrackBack URL. Outstanding. Caught this linked from an aggregate site, felt for sure w/ name 'liberalvaluesblog' it'd be a piece defending this serial corrupto-crat geriatric skank with the serial sexual-abuser husband. Glad to see her absolute lack of ethics doesn't go un-noticed by those on the 'left'. It's flabbergasting the woman isn't in prison yet. As an aside, my 14 year old niece attributes Trump's popularity to 'the fact US ballots don't have a 'None of the Above' box to check. Astute kid. Carry on! She probably won’t wind up in prison. She did many things which were unethical and in violation of multiple government regulations. Whether it can be proved that she did anything criminal is a different matter. There are basically two aspects of the scandals which could theoretically lead to criminal charges. One is mishandling of classified information. Looking at cases where there have been prosecutions, higher level people tend to get prosecuted only if it is intentional. It is only low level people who get prosecuted for more accidental things, often less than what Clinton has done. Plus most who are prosecuted wind up with a plea bargain which keeps them out of prison–but does lead to loss of their security clearance. The second area where theoretically she could be prosecuted would be for influence peddling at the State Department. Sure, it is implausible that people with business before her suddenly decided to make generous contributions to the Foundation, or pay much higher than conventional speaking fees to Bill, without expecting anything in return. However I think the Clintons are smart enough to make sure there is no hard evidence of influence peddling. Maybe there is something incriminating in the deleted email, but it is questionable if she would have even said much in her email. I’m not so sure about the explanation re Trump. Certainly his attraction is that he is outside of conventional politicians, but I do think there are people who do want to vote for him. She can't be president if she loses her security clearances, can she? I don’t know what would happen but my bet is that even if Clinton lost her security clearance this would no longer apply if she was president. I also doubt that she will be prosecuted unless even worse information than is now out should be revealed. It is unlikely we will have a situation where she is both prosecuted and still elected.